As with so many aspects of electronics, physics, economics, medicine (well, maybe not medicine), the basics do not change a whole lot since first being discovered. 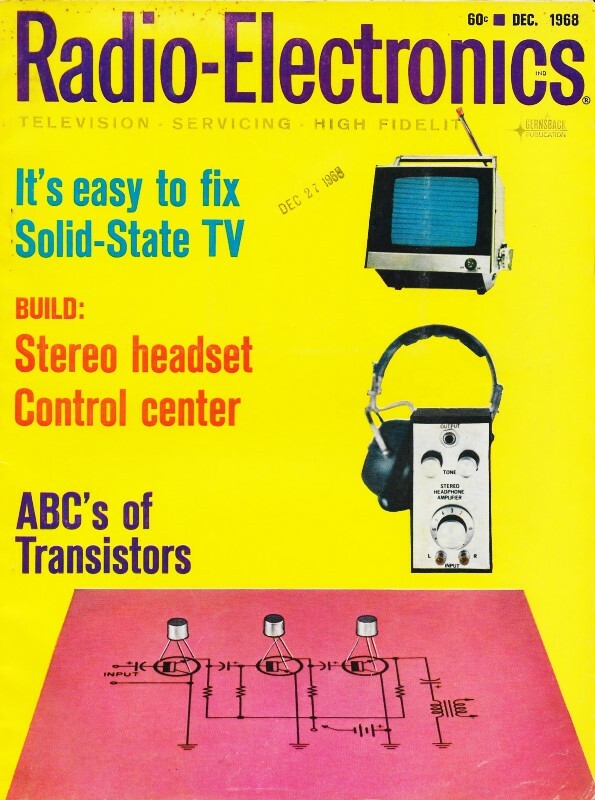 If you are a newcomer to the world of electronics and are trying to come up to speed on transistor construction and operation, even this article that appeared in a 1958 issue or Radio-Electronics magazine will be useful to you. Figure 1 reminds me of a situation I witnessed while working as a technician at Westinghouse Oceanic Division, in Annapolis, Maryland. If you've heard this before, please indulge me. One of the managers there, who was not a degreed engineer (although he held the title), one day while in the lab actually soldered a pair of 1N4148 diodes together back-to-back per Figure 1 and tried biasing it to function like a transistor. A "real" engineer, whom I greatly admired, stood watching with his mouth agape as he watched. Before he could politely explain why the diode pair is not the same as the intimate PN junctions of an actual transistor, another "real" engineer who had no compunction about dressing down someone for a stupid action lost no time setting the poor guy straight. The real tragedy is that the engineer-in-title-only (who was a very nice guy, BTW) didn't know enough about basic semiconductor physics to even understand what was being explained. Fig. 1 -Transistor diode junction equivalent schematic. Fig. 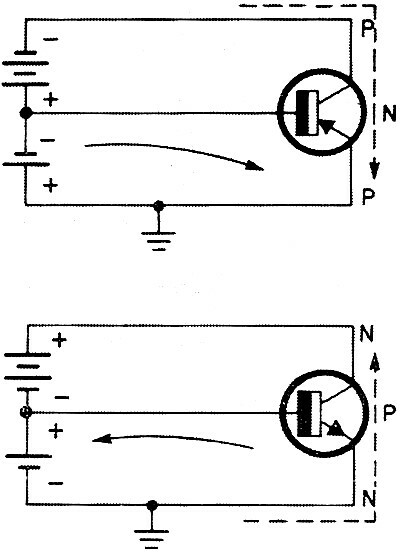 2 - NPN and PNP transistor schematic symbols. Fig. 3 - Base-emitter and collector-emitter biasing. Transistors have puzzled technicians for nearly a decade and there appears to be no sign of easing the strain. Each year more transistorized equipment is introduced in both television and hi-fi equipment. To keep up to date we must learn efficient transistor servicing procedures. Many articles have been devoted to transistor troubleshooting and all of them have leaned heavily on theory. But many successful technicians working on vacuum-tube circuits do not have a solid foundation in vacuum-tube theory, so perhaps the solid-state troubleshooter does not necessarily need theory. Let's look at transistors from a troubleshooter's standpoint and minimize the theory. The tube is a voltage amplifier. The transistor is a current amplifier. The grid of a tube usually has an opposite potential to the cathode and plate of a tube, but the transistor base potential is between the emitter and collector potentials. Transistors are further complicated as there are two types which operate with opposite bias and supply voltage polarities. Yet it is easy to determine proper polarities for bias and supply voltages and what voltages we can expect in standard circuit configurations for each type. The two basic types are, of course, pnp and npn. Physical and electrical characteristics of pnp and npn transistors are shown in Fig. 1. Both transistors are shown electrically as two diodes wired back to back. In the pnp type the cathodes are tied together; in the npn type the anodes are connected. The junction represents the base connection with the emitter or collector at either end. Two common symbols for both pnp and npn transistors are in Fig. 2. Note that the arrows in both the diodes and the transistor symbol point in the same direction. Remember this and you cannot go wrong. Fig. 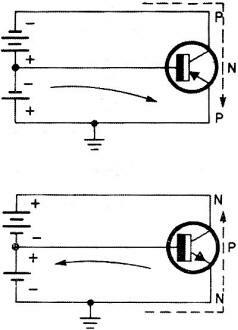 4 - Base current direction for PNP and NPN transistor. 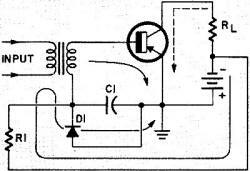 In conventional circuits a small forward bias, normally 0.2 to 0.7 volt, is applied to the emitter junction. An easy way to remember which polarity is required to forward-bias a junction is to note that, when a negative voltage is applied to an n-element and a positive voltage to a p-element of a pn junction, it is forward-biased. This is shown in Fig. 3. The letters tell you the crystal type in each element. That is, pnp stands for p-type (crystal) emitter, n-type base and p-type collector. Npn stands for n-type emitter, p-type base and n-type collector. In other words, for a forward-biased emitter junction, a pnp transistor requires a negative voltage on the base with respect to the emitter. To forward-bias an npn transistor emitter junction a positive voltage on the base, with respect to the emitter, is required. The collector circuit, on the other hand, requires a back-bias or reverse bias. So in a pnp transistor, a negative voltage is required on the collector with respect to the base and the opposite for an npn transistor. Circuits with these typical configurations are shown in Fig. 4. Note that the bias batteries are connected so they aid one another. Biasing is used in transistor circuits for the same reason that it is used in tube circuits-to set up a static operating point. 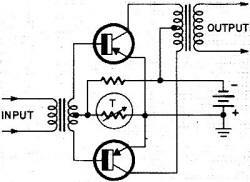 Without proper bias, what was intended to be a class-A amplifier might operate class-B. The simplest bias is accomplished with a single-resistor network. A common-emitter amplifier with a single bias resistor is shown in Fig. 5. Since the emitter-junction resistance is quite low, the base bias current can be calculated by dividing the bias voltage by base bias resistor. The base resistance is ignored because it is very small compared to the base bias resistor. In Fig. 6-a, the negative terminal of the power supply is grounded. In Fig. 6-b, the positive terminal of the power supply is grounded. Each circuit's operation is identical. The resistors form a voltage divider network and selection of various values can result in any voltage between the supply and zero volts to appear at the base of the transistor. If there is a 0.7-volt difference between base and emitter, the transistor is turned on and emitter/collector current flows. If this voltage difference is reduced, less collector/emitter current flows. Conversely if this voltage difference is increased, collector/emitter current increases. Fig. 5 - PNP transistor DC biasing. In Fig. 6-a, if a 10-volt supply is used, R2 will be approximately 9 times as large as R1 and +0.7-volt appears at the base. In Fig. 6-b, the values of R1 and R2 stay the same, but their relative positions are reversed to effect a +9.3-volt potential on the base. Either way, the base is +0.7-volt with respect to the emitter. The voltages shown are typical for a silicon transistor. Note that the base voltage is closest to the emitter voltage and between collector-emitter voltage. An important consideration is the polarity and magnitude of voltage that must be applied to the base/emitter junction to turn the transistor "on" and cause electron flow between emitter and collector. While a tube requires bias voltage to reduce electron flow, the transistor requires bias current to cause electrons to flow. A tube with zero bias between grid and cathode generally has heavy current flow while a transistor with zero bias between base and emitter is shut off and no current flows between collector and emitter. To forward-bias or "turn on" a transistor, a small voltage is applied between the base and emitter elements. When measured from the emitter, the polarity of this bias voltage is the same as the collector voltage but its value is much lower. Fig. 6 - Emitter self-biasing. Fig. 7 - Emitter stabilizing resistor. Fig. 8 - Class A (linear) transistor biasing. Fig. 9 - Input - output voltage waveforms. In Fig. 7, resistor R3 is in series with the emitter. It stabilizes collector current and is referred to as a stabilizing resistor. As collector current flows through emitter resistor R3, a voltage is developed which opposes the forward-bias voltage. The effect of R3 is to oppose any change in current flow since the voltage across it is in series with the forward-bias voltage. For example, if collector current increases, the voltage drop across R3 increases and reduces the effective forward bias which, in turn, reduces collector current. Conversely, if collector current decreases, less voltage is developed across R3 and the effective forward bias increases. This, in turn, increases collector current. Adding an emitter resistor stabilizes a transistor with respect to collector-current variations which occur for a variety of reasons. The most common cause is an increase in collector current as a result of temperature increase. When troubleshooting, the voltage drop across the emitter resistor is an important test point for checking circuit operation. A higher than normal emitter voltage generally indicates excessive collector current. This can be caused by a shorted transistor or a bias defect. A lower than normal emitter resistor voltage would indicate an open transistor or bias defect. 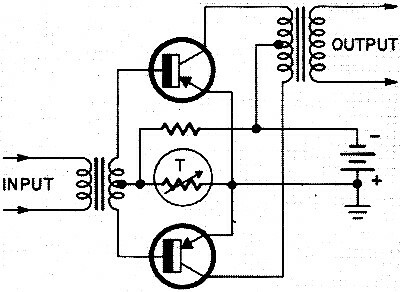 A transistor stage set up for class-A or linear operation is shown in Fig. 8. In this stage. 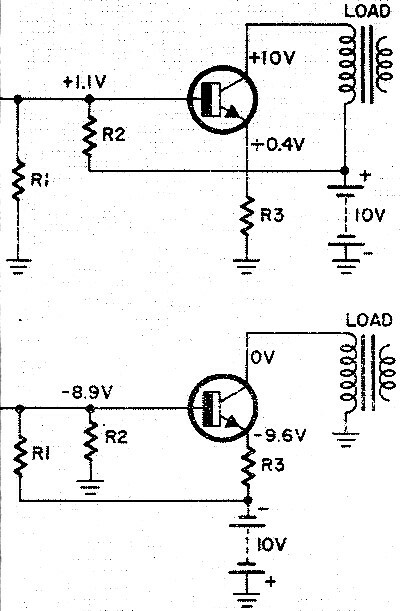 bias resistor R3 is shown as an adjustable unit, so some desired collector current will flow. 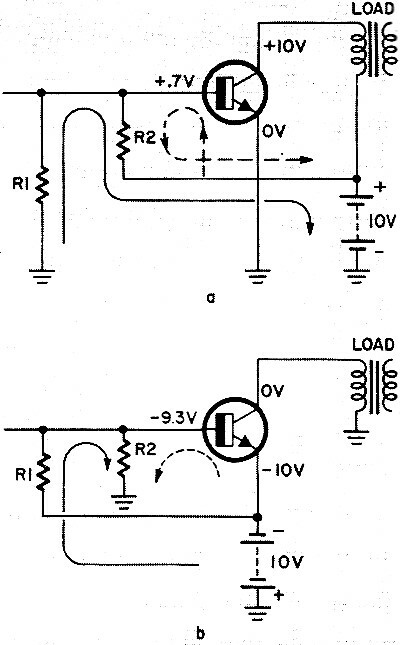 This control can be used to show how the transistor amplifies the input signal. The base voltage-collector current curve in Fig. 8 shows the collector current for several bias voltages. The horizontal line shows bias voltages developed across bias resistor R3. The vertical line shows values of collector current for each value of bias and we will neglect the effect of emitter resistor R4. Note the mark on the bottom line indicating 2.4 V. This actually means 0.1 V between the base and emitter since the emitter is at +2.3 V. This mark corresponds with a line on the vertical column marked "minimum" as indicated by the dotted lines. This means that, with 0.1 V forward bias, only a small amount of collector current will flow. If R3 is adjusted to make the base voltage become 3 V (0.7 V between base and emitter), the collector current increases. Referring again to the curve, we see that the collector current has increased to the mark on the vertical column marked "normal". If R3 is adjusted to make the base voltage become +3.6 V (1.3 between base and emitter). there will be an increase in collector current. The collector current has increased to the "maximum" level. From this we can see that by varying the base voltage, we can produce any desired value of collector current. In practice, the emitter voltage would not remain constant with different values of collector current. This action is similar to cathode-voltage variation in a tube. An ac signal fed to the base element can also cause collector-current changes. Referring again to Fig. 8, we adjust R3 to make the base voltage become +3 V. This causes a collector current that corresponds to "normal" on the curve. The collector current through R2 causes a voltage drop so about half the supply voltage appears at the collector. These are the necessary conditions for a linear stage (amplification without distortion). An ac generator supplies a signal between the base of the transistor and chassis ground in Fig. 9. 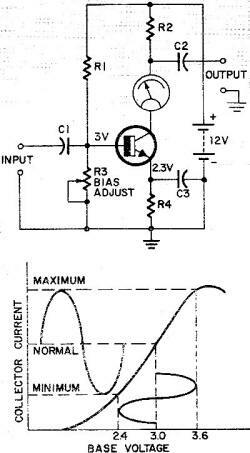 This signal at any instant will add or subtract from the de bias supplied by bias resistors R1 and R2. 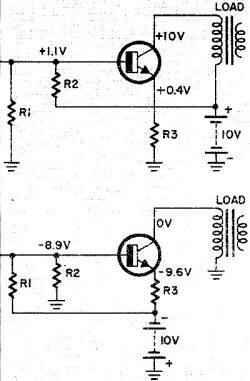 Capacitor C2 provides an ac bypass across R3 at the signal frequency. In Fig. 9-a the generator is passing through its maximum positive excursion and is producing a peak +0.05 V. This voltage will add to the +1.69 V dc bias voltage and cause a total instantaneous voltage between base and ground of +1.74 V. From the curve in Fig. 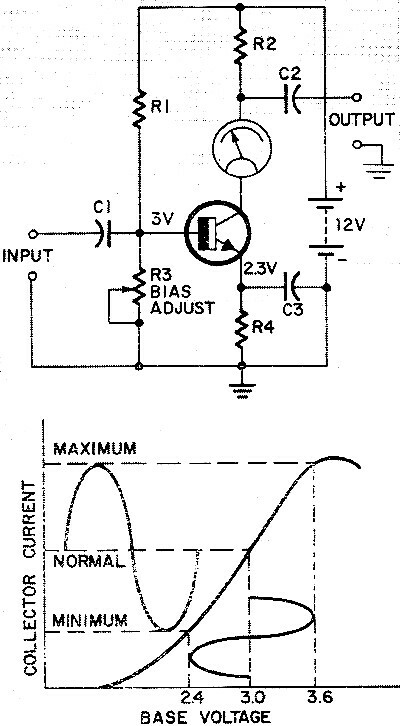 8, we see that this corresponds to maximum current through the transistor. 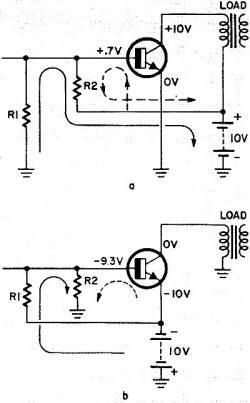 This is indicated by the current meter connected in series with the collector of the transistor. The increased current through R4 causes a larger voltage drop, so that for an instant the collector voltage drops to approximately 2.5. The result of the negative half-cycle of the generator is shown in Fig. 9-b. This negative 0.05-V excursion subtracts from the 1.69-V bias, so that for an instant the voltage between base and ground is 1.64 V. The curve in Fig. 8 shows that this corresponds to minimum collector current. The reduced current causes a smaller voltage drop across R4 and allows the collector voltage to rise to approximately +15.5. From this we can see that an input signal of 0.1 V peak-to-peak can cause a collector or output signal of 13 V peak-to-peak. Also, phase inversion occurs. The dc and ac voltage excursions shown demonstrate amplification of the transistor. Capacitor C2 is large enough to bypass R3, so that no ac signal is lost across this resistor. The voltage at the emitter will reflect any average current change through the transistor. Emitter voltage is a good indicator of transistor conduction. If this voltage is too high, the transistor current is too high. If it is low, the current is too low. Some amplifiers require a different type of bias stabilization since their primary purpose is to increase power. The circuits discussed are designed to maintain constant current. This would defeat the purpose of the push-pull amplifier, so another method is used. The most common stabilization method used for these amplifiers is to use bias elements which are temperature-sensitive. One method, shown in Fig. 10, is to use a diode made from the same material as the transistor. Fig. 10 - Diode stabilization. The diode is fed with a constant current through R1. The voltage drop across the diode biases the transistor and is inversely proportional to its temperature. In other words, as the temperature of the transistor and diode increases, the resistance of the diode decreases and the voltage drop across the diode decreases lowering the bias voltage the necessary amount. Thermistors are frequently used to stabilize push-pull output stages. Thermistors have a negative temperature coefficient of resistance. A circuit using a thermistor for bias stabilization is shown in Fig. 11. The current through the thermistor is held relatively constant by the high series resistance. The voltage drop across the thermistor supplies the actual transistor bias. 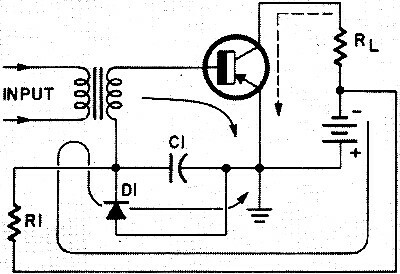 Since the compensation in this circuit is often greater than desired a parallel resistor is sometimes added to the circuit to decrease its sensitivity. Fig. 11 - Push-pull amplifier configuration. Note that the purpose of the temperature sensing element is, not to compensate for ambient temperature, but to compensate for the junction temperature of the transistor. Consequently, whether the sensing element is a diode or a thermistor it should be located intimately with the transistor or transistors that it controls.